The Police Constable Degree Apprenticeship (PCDA) is a three year practice based higher education programme, leading to a BSc Hons Degree in Professional Policing Practice. To apply for the PCDA entrants must have already achieved a Level 3 qualification (A level or equivalent) or have successfully completed the online competency based assessment. Predicted grades will not be accepted. The necessary certification will also need to be provided. If successful you will need to undertake a number of assessments and assignments during the term of your Apprenticeship. Protected study time to support your professional development will be provided, however it is also likely that a level of private study, outside of working hours, will also be needed. Further information about the programme of learning will be made available shortly. The Degree Holder Entry Programme (DHEP) is for those who already hold a degree in any subject area. This is a two-year practice-based and higher education programme. Upon completion, successful candidates will also achieve a Diploma in Professional Policing Practice. Predicted grades will not be accepted. The necessary certification will also need to be provided. If your degree was achieved outside of the UK, you must achieve ratification from a Higher Education Establishment within the UK to evidence your qualification is recognised at Degree standard. If you are yet to complete your degree, but would still like to apply, you should do so though the Apprenticeship route. If successful however you will be unable to complete your current degree qualification. The Pre-join Degree in Professional Policing Practice is for those who choose to complete the degree at a Higher Education Institution of their choosing, at their own cost. This route to join will become available at participating Universities from September 2019. To be successful you will need meet our minimum entry requirements, and demonstrate a passion and commitment to providing a first class policing service to the people of South Wales. South Wales Police prides itself on our exceptional people so if you feel that you would like to come and join us keep an eye on our current vacancies. Please be aware that on appointment and during your service you may be posted to any location in South Wales based on operational need. Applicants should also be aware that although they will be entitled to a level of protected study time in the workplace to support your professional development, it is also likely that some students will also need to undertake private study, outside of working hours. It is estimated that any learner on a degree or graduate diploma programme will carry out an average of 5 hours per week private study, although this will very much dependent upon the student. All learners are required to successfully complete the required qualification. Please note that “protected learning time” will be subject to organisational need. If you are from a diverse background and culture and would like to speak with someone about forthcoming recruitment campaigns, opportunities and support available to you, please contact our representative workforce team via e-mail or call 01656 762995. Applicants are not permitted to apply to more than one force at a time. You may not reapply for 6 months after you have received your assessment centre results. An assessment centre pass mark is valid for 1 year before a candidate would have to re-sit. Applicants are advised to check their “junk” box for email updates from the system. The College of Policing has introduced a new website with information about pre-join. Have lived in the UK for three continuous years, immediately prior to application. Have leave to enter or leave to remain in the UK for an indefinite period. N.B You will need to provide proof of this when completing your application. Not have any tattoos which are visible that could cause offence. photographs which will need to be checked. If your application is successful, your weight range will be assessed during a medical assessment. The healthy weight range is based on a measurement known as your body mass index (BMI). This can be determined if you know your weight and your height. The actual calculation is your weight (in kilograms) divided by your height (in metres squared). Guidance and easy to use charts on how to calculate your BMI can be found on the NHS website. The NHS advises that a BMI of 18.5 to 24.9 suggest a normal healthy weight. This means your body is not at risk of weight-related disease. The Home Office sets BMI standards for police officers. The current Home Office circular 59/2004 outlines this as between 18 and 30. Applicants who do not meet this standard may find their application delayed and / or will not be appointed. You will also be asked to undertake a drugs test and provide information about any medication you may be taking. If you should fail the drugs test you will not be offered a position with South Wales Police. Any internal candidates who fail a drugs test will have their offer withdrawn and the results from the drugs test may be used in accordance with the South Wales Police Staff Discipline Police and Police Staff Code of Conduct. Legislation has been introduced that requires applicants to undergo biometric vetting. Please refer to NPIA Circular 03/2012 which can be viewed on College of Policing website. This means we will be asking you to sign a consent form to take your fingerprints and a sample of your DNA for the purposes of a speculative search and for your fingerprints and DNA profile to be retained on the Police Elimination Database (PEDb). The purpose of obtaining fingerprints and DNA samples is to allow a speculative search to be made against the local and national databases prior to your appointment to the police force. This is to ensure that you have not previously come to adverse police attention, which you have not informed us of, and that you are not linked to any outstanding crime scenes. We will ask you to take these tests after we have we have successfully completed all your background checks. Policing can be physically demanding, so you will need to be in good physical condition to pass the fitness test. As part of your assessment, you will be tested to ensure your fitness levels are high enough. It is a thorough test, but don’t worry, it’s not about being super fit. We only want to make sure you would be physically able to carry out your duties. If you don’t meet the standard first time around, you can take the test again up to a maximum of three times, with six weeks in between each attempt in order for you to develop and improve. You will also be required to attend a pre-appointment fitness test approximately 6 weeks prior to the anticipated appointment date and you must pass this to progress your application. Annual Leave of 22 days (increasing with length of service), plus bank holidays or time in lieu. Childcare Vouchers scheme – which can be used to pay for approved childcare providers. Assistance in gaining professional policing qualifications. Support and advice from Occupational Health and access to a range of wellbeing services. Support and advice from our Staff Associations and Support Networks which include: Female Police Association, LGBT Network, Black Police Association, Christian Police Association, Ability Support Network, Police Federation, Unison, GMB. Training, development and promotion opportunities within an organisation, which values continued professional development. Lifestyle and organisational discounts, which include travel, financial products, an eye care scheme and many more. The first year of police training will be classroom based. Police officers and police staff trainers will deliver the course at a police-training establishment in Bridgend. Constables are always expected to display the appropriate behaviour and attitude during their training in line with the police service’s Code of Ethics. Following the successful completion of year one officers will commence a period of tutoring at an operational police station with a qualified tutor. Successful completion of the tutor phase will allow student constables to be placed on independent patrol. In years two and three, whilst working in an operational environment, student constables on the apprenticeship will be working towards achieving a degree in Professional Policing Practice whilst Degree holder student constables will be working towards achieving a Graduate Certificate in Professional Policing. Recruits on both programmes will be required to complete an occupational competency portfolio during their probationary period, and will be required to complete a level of private study, outside of working hours. Our Eligibility criteria is detailed in full on our website. However if you have any questions which we have not answered, please feel free to contact us directly. First step will be an on-line application process which entails several on-line tests and an application form. All tests must be successfully completed before you can complete the application form. Following successful completion of the application process you will be contact by HR to take part in the remaining elements of the recruitment process, details of which are on our website. Our selection procedure is no different for all applicants, and is based solely on merit. The procedure does not remove competition and South Wales Police will always take the best applicants. If I am successful in the recruitment process, but I fail to achieve the necessary qualification will I have to pay back any costs? You will receive full support throughout your probationary period, however should you fail to meet the required standard, you will not be expected to pay back any of the costs incurred. Can I decide to withdraw from the recruitment process at any point? The short answer is yes you can. Policing is an exciting but equally challenging role, which is not for everyone. However, we do ask that all prospective police officers fully consider these challenges and their suitability before submitting their application. As an Apprentice, how long will I be on probation for? As a student enrolled on the Police Constable Degree Apprenticeships ( PCDA ) you will have a 3 year probationary period. As a Degree Holder, how long will I be on probation for? What will the Apprenticeship probation period look like? Following appointment, you will embark on a 6-month initial learning programme at South Wales Police Learning and Development services Bridgend. You will also undertake a 12 week tutoring period within the community, where you will be expected to achieve independent patrol status. For the remainder of the probationary period you will carry out operational duties in the workplace gathering evidence of occupational competency. You will also be required to carry our academic elements assigned to you by a partner university. Successful completion of both practical and academic elements will result in you being confirmed in rank. What will the Degree Holder probation period look like? Following appointment, you will embark on a 6-month initial learning programme at South Wales Police Learning and Development services Bridgend. You will complete a 12 week tutoring period within the community, where you will be expected to achieve independent patrol status. The remainder of the probationary period you will carry out operational duties in the workplace gathering evidence of occupational competency. You will also be required to carry our academic elements assigned to you by a partner university. Successful completion of both practical and academic elements will result in you being confirmed in rank. So how is one shorter than the other? This is due to the variance in the the academic requirements. Will I be given time to complete the academic elements of the qualification? Yes you will. The Force and HEI have calculated the amount of time required for you to complete all elements of the qualification and this will be rostered into your shift pattern. If I fail at any point during the recruitment process, can I resit? If you fail at any point in the process, the force will notify you. While it is not possible to complete a resit, it will be possible to re-apply within six months following notification. All face to face delivery will take place on police premises within the South Wales Police area. Self-study and on-line learning will be carried out remotely. No – any travelling costs incurred will be your responsibility. Students will be provided with learning materials by both South Wales Police and the partner University at no cost. I don’t have level 3 qualification, can I still apply? Yes you can still apply for the PCDA ( 3 year apprenticeship ) however you will be required to carry out an on line test that measures academic capability. What if I want to apply but I don’t have any qualifications? If you do not have a Level 3 qualification or above you must also successfully pass a verbal reason and calculation test. This will test your academic ability to Level 3. If you successfully complete the above tests, but if you fail in another part of the recruitment process, you will not be required to retake these tests again, should you wish to re-apply after 6 months. There are 2 tests that every applicant must complete (regardless of qualifications), these are a Situational Judgement test and a Behavioral Style Questionnaire. Both of these must be passed in order to continue in the application process. Do I need a CKP to apply? You no longer need a CKP to apply, however a CKP is classed as a Level 3 qualification and therefore if you already have a CKP this can be used as the Level 3 qualification required to apply. If I am a serving PCSO or Special Constable, but I don’t have a Level 3 qualification, can I still apply? Yes you can , however the eligibility requirements for the Apprenticeship route will still apply. Thank you for your interest. Our Police Officer Recruitment Campaign is now closed. Can I transfer my Police National Assessment Centre (SEARCH) score to South Wales Police? If you are interested in a career with us, we are currently accepting transfer of SEARCH result. 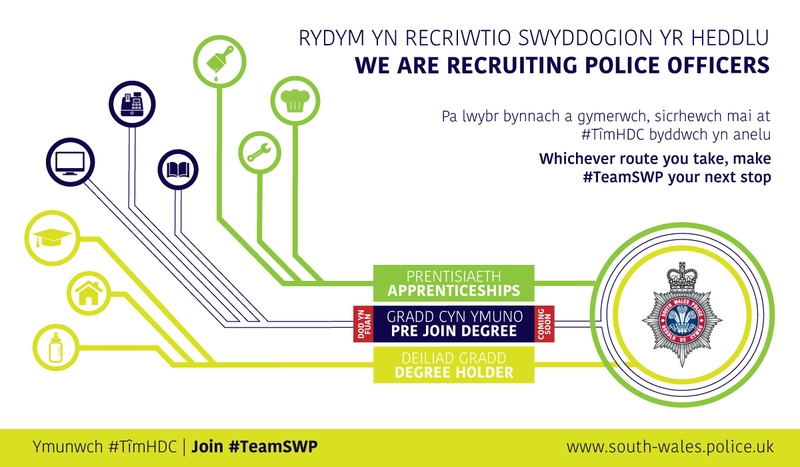 If you are interested in your results being transferred, then please email HR-RECRUITMENT@south-wales.pnn.police.uk and attach your confirmed SEARCH results. The recruitment team will then contact you and advise on the next stages of the process. Please note we are unable to accept transfer of results from applicants that have failed at local force interview or pre-employment checks with another force.